Don't miss your opportunity to purchase the latest ornament from the MCTB. 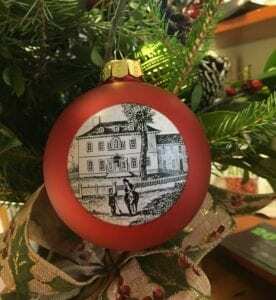 Not sold in stores, this exquisite glass ornament features the illustration of The Ford Mansion where General George and Martha Washington spent the Christmas of 1779, when Morristown served as the army’s winter headquarters. It was there that Washington hired one of the military bands of to play music at Headquarters at a cost of 15 pounds. The ornaments are manufactured in the USA using only American products.